A historic decision by the Supreme Court is going to open the floodgates for legal sports betting throughout the country, and there will be billions of dollars pouring in. Unfortunately, many of the gambling stocks you'll hear about in the mainstream media are overvalued and not worth buying. On May 14, the Supreme Court handed down a landmark decision that effectively opens the door to legalized sports betting nationwide. The decision struck down a federal law that forbade U.S. states from allowing sports betting on professional and college-level sports. In the past, if you wanted to place a bet on a sporting event, you needed either to fly to Vegas or locate a black market bookie to take your cash. But thanks to the Supreme Court's decision, within the next few years, as many as 20 U.S. states could have legal sports betting. 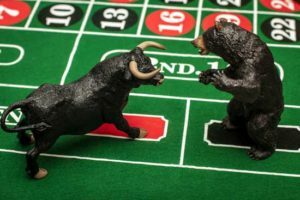 Of course, it's a virtual guarantee that the gambling stock price on any casino or other gaming-related stock is now more inflated than ever. The investment we've uncovered has nothing to do with smoky casinos or sports facilities that are mired in debt.